Simply wearing a corset will reduce your waistline by a couple of inches, which will in turn improve your posture, support your lower back and make your clothes look better. And this is before you have even begun to “diet”! Wearing a corset puts pressure on your stomach as well as your waistline. One of the reasons people lose weight when they have gastric bypass surgery is because their stomach is made smaller, so they feel full much more quickly. A corset will produce a similar effect by putting pressure on the stomach, causing us to feel full much more quickly. Food may also digest more slowly, keeping us from wanting to eat again for a longer period of time. You will need to have a well-fitted corset that is comfortable for daily wear. Some people may be able to wear a standard size corset, but remember that a custom fitted corset is always more comfortable. If you want to start corseting quickly, we recommend that you order a stock-size corset AND a custom fitted corset. 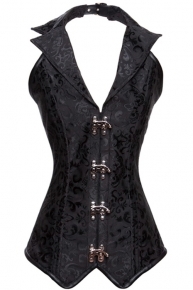 You can get started on a limited basis while you wait for your custom corset to arrive. Otherwise you will want to plan ahead 4-8 weeks for your custom corset to be completed. Contact Corset Connection.com with your measurements for help on selecting the correct corset, and please let us know what your goals are. Put your corset on as soon as you wake up in the morning. If you shower in the mornings, then do that immediately upon wakening, and put your corset on directly afterwards. If you eat or drink anything at all your corset will not go on as easily. Lace the corset snugly, but not tightly, and get ready for your day. Before leaving your home or starting your day, lace the corset a little tighter, so that it is quite snug, but not uncomfortable. If you experience bloating or discomfort during the day be sure to loosen the laces. If anything is at all painful you will want to remove your corset. Do NOT remove your corset directly after eating a good-sized meal, or you will experience discomfort. After eating you will feel full, and if you remove the corset this will lessen the pressure on your stomach and may cause stomach pain or cramping. This is another good reason to not overeat while wearing a corset.